Iran's UN Ambassador accuses Washington of "stepping up its intervention" in the country as protests continue. Iran on Wednesday angrily accused the United States of meddling in its domestic affairs after President Donald Trump backed anti-government protests, AFP reports. Iran's UN Ambassador, Gholamali Khoshroo, said in a letter that the U.S. government "has stepped up its acts of intervention in a grotesque way in Iran's internal affairs under the pretext of providing support for sporadic protests, which in several instances were hijacked by infiltrators." 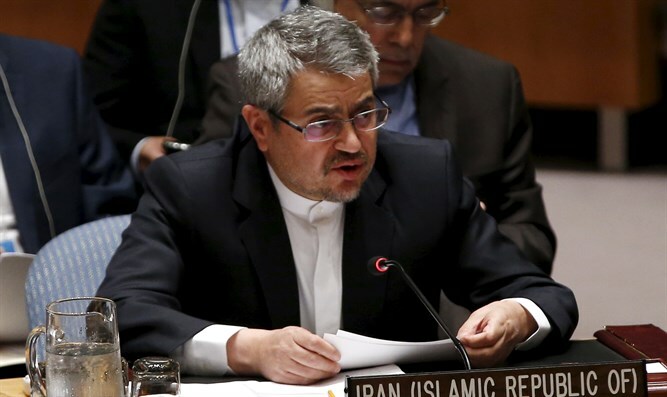 Khoshroo charged that the United States had violated international law and the principles of the UN charter, and urged countries to condemn Washington's statements. "The president and vice president of the United States, in their numerous absurd tweets, incited Iranians to engage in disruptive acts," said Khoshroo in the letter which was addressed to the Security Council and to UN Secretary-General Antonio Guterres. "The U.S. Department of State went so far as admitting that the US government wants to encourage protestors in Iran to change their government, admitting that the U.S. is engaged in interfering with the internal affairs of Iran through Facebook and Twitter," claimed the Iranian envoy. The letter was released after Trump pledged to help Iranians "take back" their government and the White House weighed sanctions against those involved in the crackdown against demonstrators. "Such respect for the people of Iran as they try to take back their corrupt government. You will see great support from the United States at the appropriate time!" Trump tweeted. Khoshroo’s letter came a day after U.S. Ambassador to the UN Nikki Haley said she would be seeking an emergency UN Security Council meeting to discuss the violence that has left 21 dead. Diplomats said Wednesday that no such meeting was scheduled for the time being. Russia and China are among the countries that are expected to oppose Security Council action on Iran, diplomats said. Khoshroo is not alone in suggesting that the U.S. is behind the protests in his country. Iranian Supreme Leader Ayatollah Ali Khamenei claimed on Tuesday that "Iran's enemies have been encouraging the demonstrations in the country in recent days with money, weapons and intelligence agents." Similarly, Iran’s former president Mohammad Khatami, who is viewed as a “reformist” and a “moderate”, accused the United States of stirring unrest in the country.